There’s a little money left over in Hamilton County’s sales-tax pool after paying off bonds on the Cincinnati Reds and Bengals stadiums, so county property owners will get an $8 million property tax reduction this year. That’s a mere fraction of what county officials promised when they passed the sales-tax hike 20 years ago, but at least this year they won’t have to sell any hospitals. Franklin County, Ohio, says it plans to build a new Columbus Crew arena … somewhere, costing … something, with the county putting up $50 million in cash — part of which would go toward turning the old Crew stadium into a “public sports complex” — plus land and infrastructure worth … something. But Franklin County commissioner Marilyn Brown told the Columbus Dispatch that “it will have mixed-use included, so it’s an economic-development deal that will include apartments, retail along with it. So it will have enormous economic-development benefit,” so it’s all good, because who can put a price tag on enormous? NHL commissioner Gary Bettman says he’s “disappointed” that Ottawa Senators owner Eugene Melnyk is backing out of a downtown arena deal, and offered to provide league help in cutting a new deal. Hands up anyone who thinks that means “Leaning on Melnyk to pay for the arena he said he would” and not “Leaning on Ottawa to bail Melnyk out with public dollars”? Plans for a Portland baseball stadium surrounded by affordable housing may have hit a snag, as two city commissioners say the land targeted for the stadium isn’t zoned for affordable housing. Or for a stadium, unless it can prove it has enough transportation first. These are the kinds of details you’d normally want to resolve before announcing a stadium plan, but then, so would making sure you’re using Euclidean geometry. The cash-strapped county can’t pay the Bengals this year because it faces $28 million budget deficit in 2019. The county is considering raising the sales tax to help keep the overcrowded jail running, pay for sheriff patrols and avoid deep cuts to staffing. If Hamilton County ends up adding “laying off sheriffs” to “selling public hospitals” on the list of things it’s done to pay for this Bengals stadium over the years, it will truly cement its place as negotiator of the worst lease in the history of professional sports. If it hasn’t already, that is. Hamilton County Commission President Todd Portune told WCPO he has no plans of writing that check to the NFL team. The Hamilton County administrator also did not include the payments in his proposed budget for 2018. The Bengals’ lease only has nine more years to run, because the terrible, terrible lease only required them to stick around for 26 years rather than the 30 that is more standard in these things. So even if the team sues, and then threatens to move, they’re probably going to do that soon anyway, so might as well save $2.67 million a year in the meantime. The rest of the deal, including that infamous state-of-the-art clause that the county has to buy the Bengals anything that other NFL teams get, is only going to get more expensive in coming years, as more NFL teams get other things that the Bengals don’t have. So if you’re going to break the lease, this is as good a time as any. There aren’t any cities with newer stadiums out there for the Bengals to threaten to move to, so it would be a multi-year process for them to try to find one and get a stadium deal there, at which point the lease will likely be about to expire anyway. Who knows, maybe the county really does have some kind of legal opinion that the lease clause is illegal? Anything is possible. I don’t actually know if Portune is trying a “break up with the Bengals before they break up with us” gambit, but if so, it’s not a bad one at all. He told WCPO-TV that he’s hoping to start renegotiating a longer-term lease immediately rather than wait until 2026 is nearer, and this will certainly start the ball rolling in the right direction; given other recent lease extension deals, the county is probably looking at some pricey demands from the team owners, but may as well find out now. 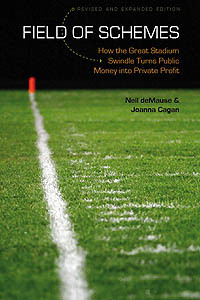 This is almost certainly going to involve move threats (or at least saber-rattling) from the team, and a huge uproar over which would be worse, Cincinnati losing its NFL team or throwing even more good money after bad on its stadium lease — but as we’ve seen before, you can’t win in the stadium negotiation game without playing hardball, so if that’s what this is, it’s a noble start. Friday news: Phoenix funds Brewers but not Suns, brewers float crowdfunding Crew, and more! Four of Phoenix’s nine city council members are opposed to the Suns‘ request for $250 million in city money for arena renovations, which helps explain why the council cut off talks with the team earlier this week. Four other councilmembers haven’t stated their position, and the ninth is Mayor Greg Stanton, who strongly supports the deal, meaning any chance Suns owner Robert Sarver has of getting his taxpayer windfall really is going to come down to when exactly Stanton quits to run for Congress. And also speaking of Phoenix (sort of), the Arizona Coyotes are under investigation by the National Labor Relations Board for allegedly having “spied on staff, engaged in union busting and fired two employees who raised concerns about pay.” None of which has anything directly to do with arenas, except that 1) this won’t make it any easier for the Coyotes owners to negotiate a place to play starting next season, when their Glendale lease runs out, and 2) #LOLCoyotes. A U.S. representative from Texas is trying to get Congress to grandfather in the Texas Rangers‘ new stadium from any ban on use of tax-exempt bonds in the tax bill, saying it would otherwise cost the city of Arlington $200 million more in interest payments since the bonds haven’t been sold yet. (Reason #372 why cities really should provide fixed contributions to stadium projects, not “Hey, we’ll sell the bonds, and you pay for whatever share you feel like and we’ll cover the rest no matter how crappy the loan deal ends up being.”) Also, the NFL has come out against the whole ban on tax-exempt bonds because duh — okay, fine, they say because “You can look around the country and see the economic development that’s generated from some of these stadiums” — while other sports leagues aren’t saying anything in public, though I’m sure their lobbyists are saying a ton in private. A Hamilton County commissioner said he’s being pressured to fund a stadium for F.C. Cincinnati because Cincinnati will need a sports team if the Bengals leave when their lease ends in 2026 and now newspapers are running articles about whether the Bengals are moving out of Cincinnati and saying they might do so because of “market size” even though market size really doesn’t matter to NFL franchise revenues because of national TV contracts and oh god, please make it stop. MLB commissioner Rob Manfred says the proposed Oakland A’s stadium site has pros and cons. Noted! NHL commissioner Gary Bettman says the Calgary Flames‘ arena “needs to be replaced” and the team can’t be “viable for the long term” without a new one. Not true according to the numbers that the team is clearing about $20 million in profits a year, but noted anyway! The Seattle Council’s Committee on Civic Arenas unanimously approved Oak View Group’s plan to renovate KeyArena yesterday, so it looks likely that this thing is going to happen soon. Though apparently the House tax bill would eliminate the Historic Preservation Tax Credit, which the project was counting on for maybe $60 million of its costs, man, I really need to read through that entire tax bill to see what else is hidden in it, don’t I? The owners of the Rochester Rhinos USL club say they need $1.3 million by the end of the month to keep from folding, and want some of that to come from county hotel tax money. Given that the state of New York already paid $20 million to build their stadium, and the city of Rochester has spent $1.6 million on operating expenses over the last two seasons to help out the team, that seems a bit on the overreaching side, though maybe they’re just trying to fill all their spaces in local-government bingo. There’s a crowdfunding campaign to buy the Columbus Crew and keep them from moving to Austin. You can’t kick in just yet, but you can buy beer from the beer company that is proposing to buy the team and then sell half of it to fans, and no, this whole thing is in no way an attempt to get free publicity on the part of the beer company, why do you ask? The city’s two current major league sports teams — the Reds and the Bengals — will eventually come knocking on the county’s door for a new deal. The Bengals stadium lease with the county expires in 2026 with the Reds’ lease expiring a few years after. Combined, the two stadiums could need more than $200 million in upgrades within the next decade. “While no one is talking about demoing these stadiums, we know there will be substantial maintenance (needs),” [Hamilton County Administrator Jeff] Alutto said. 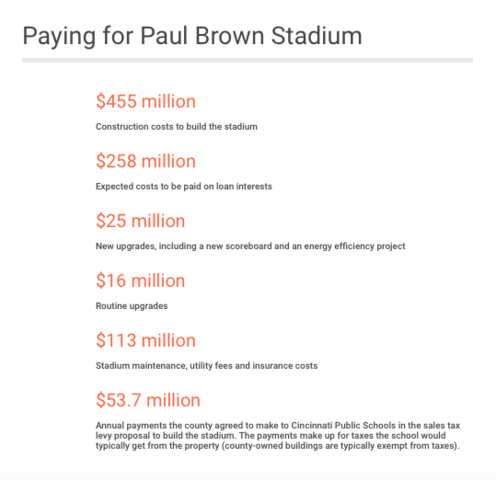 Those leases running out are worth planning ahead for, I suppose, but it’s still a little worrisome that Hamilton County is already budgeting for stadium renovation “needs” that the teams haven’t even asked for yet. Apparently either somebody hasn’t gotten the memo that it’s okay to demand that taxpayers not take a bath on stadium projects, or else Hamilton County leaders think that Cincinnati has less leverage to keep its teams without bribing them to stay, which, okay, maybe. That said, the rest of the county’s wish list includes a $230 million convention center expansion and a $342 million rebuild of the city’s arena, neither of which exactly seems like a “need” per se. If the only choice for Hamilton County is which dumb project for private profit to sink public money into, I can sort of see why soccer fans would feel justified in saying, “Us first!” Too bad overcrowded prisoners don’t have fan clubs. The Las Vegas Raiders plan to have most of their fans park three miles away from their new stadium on the UNLV campus, and then take shuttle buses to the game, I guess? I am getting more and more concerned about how much those as-yet-unknown highway infrastructure costs are going to come to. St. Paul wasn’t able to get hold of $1.5 million in state grant money to prep the site of its new Minnesota United stadium. so instead it’s going to use incremental tax revenue generated by two other development projects in the city. Which are nowhere near the stadium site, and so won’t actually receive any new incremental revenue as a result of the stadium being built. Uh, guys, I think we are straining the definition of the word “incremental” here. “Three years after Charlotte City Council agreed to spend nearly $28 million on improvements to the Spectrum Center, the Charlotte Hornets and the city are scheduled to start haggling in 2019 over a second round of renovations, which would like cost many more millions.” This thanks to a state-of-the-art clause in the Hornets’ lease that says the city has to provide any amenities that at least 50% of other NBA teams have. And speaking of state-of-the-art clauses, a reader writes, “Does the Cincinnati Bengals upgrade clause include this?” And that’s all for today, have a great weekend! Hey, know what we haven’t done in a while? A Friday news roundup. Let’s do one of those now! OMG OMG a Populous architect is actually talking about holographically projected players! The Cincinnati Bengals must be drooling at the possibility of using their state-of-the-art clause to demand such a system as soon as any other team has one! Me, I’m just excited that my dream of replacing human NFL players with Madden ones is a step closer to reality. One of the minority Arizona Coyotes owners who Andrew Barroway just bought out says he “doesn’t know” if the team can survive in its current market, because “I don’t know if they’re going to get a new arena. If they do not, it will probably remain as it has for a long time.” Which actually seems to be the opposite of doubting that the team can survive in its current market, since “remain as it has for a long time” is kind of the definition of survival? The folks who are suing to block city funding of the new Detroit Red Wings and Pistons arena are now suing to block the city council from voting to approve the funding, because duh. Last year’s Olympics in Rio de Janeiro cost an estimated $13.1 billion, though some of that was paid for by private sources, according to an Associated Press analysis. Remember, kids: Friends don’t let friends bid on the Olympics. An MLB.com writer says the new Atlanta Braves stadium is almost as good as toasted grasshoppers, which seems about right. Hamilton County’s lease deal with the Cincinnati Bengals is bad. Real bad. There’s the requirement that the county pay to add such items as “holographic replay systems” in the event they’re ever invented, for starters — but also plenty of items costing taxpayers plenty of money here in the actual present. How much money, you ask? By the time 2026 rolls around and the 26-year lease between the team and the county expires, the county will have spent more than $1.1 billion on the deal for the Bengals to play in Cincinnati. Even if you don’t count the interest payments, that’s about $650 million so far, with tens if not hundreds of millions more to come over the next ten years. 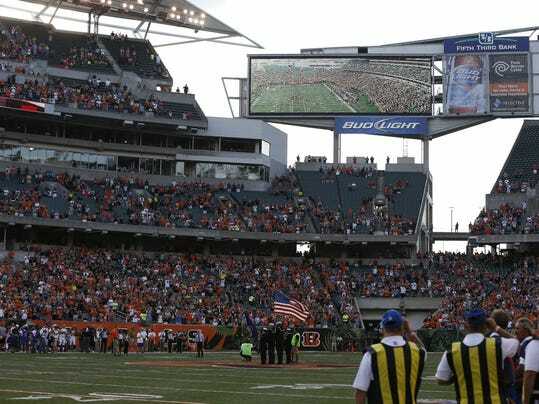 By which point the Bengals will almost certainly be demanding a new stadium, or at least a new lease with further upgrades to what will then be a 26-year-old venue. You really have to hope that this time county officials will pay attention to the fine print, but probably not. Reading between the lines of the story, it doesn’t sound like the Bengals have a wish list of improvements (in fact, Bengals development director Bob Bedinghaus specifically said he doesn’t have such a list), but rather that they’re taking advantage of a clause in the lease to trigger a review of other stadiums to see what they can shake loose. If the team and county can’t agree, it goes to a panel of arbitrators; given how that worked out in St. Louis with the Rams‘ similar state-of-the-art lease clause, it’s probably not too early for Cincinnatians to commence panicking about now. The Hamilton County Commission voted Wednesday to approve paying for three-quarters of the cost of a new $10 million scoreboard for the Cincinnati Bengals — something it actually agreed to back in April, and which it kind of had to given the horrible, horrible lease the county agreed to with the Bengals that requires the public to buy the team anything that the kids down the block have. But anyway, now it’s official and all. I’d love to show you a rendering of what the new scoreboard will look like, but this is all that any news sites have run with their stories. Is that the old scoreboard, or a Photoshopped rendition of what the new scoreboard will look like? I’m going to have to find somebody who’s actually been to a Bengals game to tell me, aren’t I? At least maybe this year some fans won’t be too embarrassed to admit it.